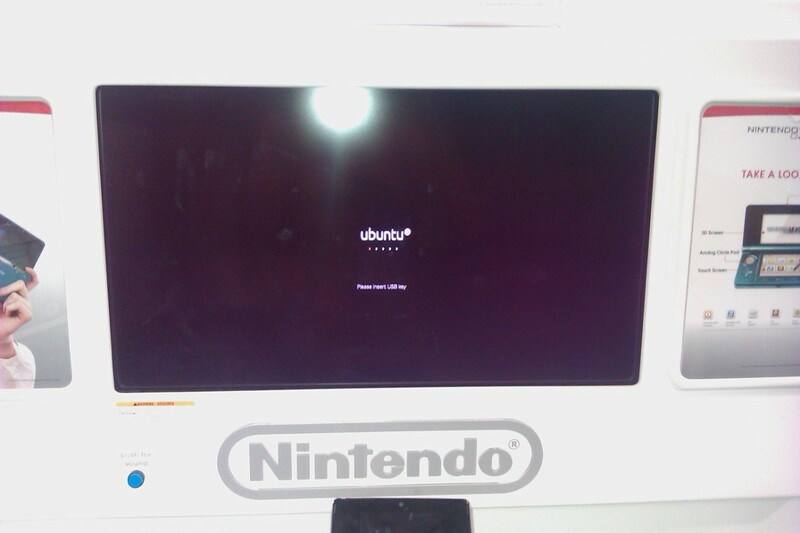 Ubuntu was spotted at a Best Buy Store, Loveland, CO on a display powering a promotional video/slideshow for Nintendo. Aenigma @ Reddit spotted this and quickly posted a picture. And to think, they kicked me out of Bestbuy for wanting Ubuntu on a netbook. This was around...2008? I went in to one of the Bestbuy's at Tigard, Oregon. Asked for my Windows Refund, or just to get a laptop with Ubuntu installed...got the "lemme ask my manager" response, 30 minutes later the manager "banned" me from the store. I know a year or two back there was some news about Best Buy selling Ubuntu powered systems. Not sure if it still does. Want to read more about such incidents? Read this.